TheGifted Arts Co-founder and CEO Nicholé Morgan has been named one of the Triangle’s '10 to Watch' leaders, by the United Way of the Greater Triangle. United Way of the Greater Triangle (UWGT) named the inaugural class of the ’10 to Watch’, a cohort of leaders selected for their impact and potential to shape the future of the Triangle. ’10 to Watch’ is a new investment initiative created to address the racial and cultural disparities between the leaders of nonprofit organizations and the communities that they serve as well as to address racial and gender disparities when it comes to organizational resources. TheGifted Arts is located on Main Street in Garner. Nicholé Morgan is the Co-Founder and CEO of TheGifted Arts. As a woman of color, foster alum and beneficiary of supplemental education and community recreational programs, during her youth, Nicholé has a sincere connection to education reform, social services and the performing arts. For just over half of her life, she has been dedicated to being an advocate and catalyst for change and opportunity for all young people. Before devoting her full attention to TheGifted Arts, Nicholé served in many education and youth development capacities; most recently with eight years of service at Citizen Schools, serving as an AmeriCorps National Teaching Fellow, Recruitment Manager and later becoming the National Director of Fellowship Recruitment and Pathway Development, while also co-leading as a key member of the National Diversity Working Group. She also served with organizations, such as the YMCA in Virginia and Boys and Girls Clubs in Massachusetts. 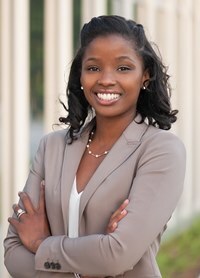 As a first-generation college student, Nicholé earned her Bachelors degree in Sociology, with a concentration in Criminology from Hampton University and received her Masters of Education and Leadership from Lesley University. While Nicholé currently resides in Raleigh, NC, she is a proud Boston native. Outside of TheGifted Arts, Nicholé enjoys being married to her husband of nearly three years, cooking, music, dancing and spending time with her family and friends.